When James Fox, the head of University of Oregon’s Special Collections, first looked over James Blue’s filmography, he immediately had a question. “What is up with the Texas docs, Anne? !” Why did Blue choose to work in public television at the peak of his reknown? Nearly everything about James Blue’s career is unpredictable. If you had to pick one film to typify the contradictions in his career, Kenya Boran, the hour long ethnographic film he co-directed with David MacDougall might be a leading contender. Commissioned by American Universities Field Staff, Kenya Boran was funded by the National Science Foundation. For an Oscar nominated filmmaker, this is as far outside Hollywood as you can get and still stay on this planet. My favorite moment in Kenya Boran is when young Peter Boru responds to a question about the meaning behind a male tribal ritual. Why do they do that? Why do they dress in ceremonial costume, paint their faces, dance themselves into ecstatic trances, and segregate themselves from the group? Peter is incredulous that the filmmakers need to ask. They are friends, he explains. They love each other. Like you do, he adds. Who decides who knows what about who? We watch Peter in the classroom, being told he should aspire to become a lion instead of a frog. We see him being taught to throw a spear. His attention wanders. He is as unimpressed with his father’s spear throwing as he is by the filmmakers’ clueless questions of “why?” Peter’s existential dilemma becomes clear. He can’t acquire the skills needed for the traditional life of herding cattle and at the same time attend school. His family sends him to school. Is he being ruined by the classroom, or saved? James Blue is in familiar territory here, as four of his USIA films focused on Third World development. But Kenya Boran was not made by the USIA. It is not an act of public diplomacy. Although similarly preoccupied with asymmetries of ignorance/knowledge, it comes at the question from a slightly different angle. Blue’s gift as an artist was the ability to find the story which reveals the community’s heart. Will the village at Rincon Santo get a school? (Yes,they will.) Will the blind child receive his sight? (Yes, he does.) Will 200,000 Americans march to the Lincoln Memorial from the Washington Monument without incident? (Yes, they will.) But in Kenya Boran, the question “what does the future hold for Peter Boru?” is not matched with an answer. Children in Blue’s previous films illustrate the theme of preparing for the future but Peter Boru, with his cool, skeptical, self possession, cannot be deployed for that purpose. The very idea of preparing for the future explodes in our face, when, at the end, the three college educated Kenyans who worked on the film as translators explain to the camera that they cannot find jobs. The theme of knowledge vs. false knowledge dominates the very first discussion we overhear, as the men of the community systematically dismantle the logic behind the Kenyan government’s decision to encourage smaller families. We follow the flow of ideas in subtitles while we hear the conversation unfold in Swahili. David and Judith MacDougall pioneered the practice of subtitling ethnographic films, and I witnessed its benefit: In the discussion following the James Blue Tribute screening at the Schnitzer Cinema, an audience member commented that the Boran men observed a cultural practice of repeating the last phrase of the last sentence spoken by their conversational partner before offering their own response. (Someone commented “Active listening!” No one said “Wisdom!”, although we probably were all thinking it.) The audience member who noticed the conversational repetition did not understand or speak Swahili. Her observation was only possible because the soundtrack did not bury the original conversation under a filmmaker’s voice over narration. The story within the story of Kenya Boran is that it documents both life among the Boran, and James Blue’s release from story driven documentary filmmaking. David MacDougall had made two ethnographic films before he traveled with James Blue to spend two months shooting the daily life of a pastorialist tribe adjusting to change in Kenya. He uses Kenya Boran to teach Blue, his one time teacher, a form of filmmaking which actively avoids control of all the elements which confer narrative power. Trying on the ethnographer’s hat, for James Blue, meant foregoing use of his greatest strengths. Kenya Boran is a haiku. It achieves its quality of spaciousness (the glimpse of failure of strategies created to contain) by observing strict formal conventions which, by limiting choices, enforce simplicity. Refined, sophisticated, and spare, the architecture of a haiku/ethnographic film is visible to fellow practitioners, while the work itself is accessible to anyone and everyone. Its minimalism does not dilute, but rather accentuates, its impact. In Kenya Boran, we see Blue learning how to use the camera, not as a paintbrush creating beauty, as he has in the past, or an x ray machine exposing social injustice, as he will in the future, but as a seismograph, registering shifts in perception. Blue liked collaboration. He worked closely with Jean Pélégri on The Olive Trees Of Justice, and with George Stevens, Jr. at USIA. He co-directed A Few Notes On Our Food Problem with Stevan Larner, and The Invisible City with Adele Santos. I see his creative partnership with David MacDougall on Kenya Boran as one of the most influential of all his duets. After this, no turning back. After he and MacDougall finished Kenya Boran in Houston, Blue began Who Killed Fourth Ward?, a multi episode participatory documentary designed for public television. Without the interlude in ethnographic film, I very much doubt he would have made the transition to experimental doc. It is fitting that Richard Herskowitz programmed Kenya Boran as the last film in James Blue Tribute screening series, since it was the last project James Blue made entirely on film. Kenya Boran is available for purchase here. I saw Kenya Boran on April 23, 2014 at the Schnitzer Museum of Art, as part of the James Blue Tribute organized by the University of Oregon. David MacDougall, the co-director of Kenya Boran, introduced the film. More information about David MacDougall can be found here. Notes On James Blue is a blog kept by Anne Richardson, of Oregon Movies, A to Z, to document her own learning curve as she attends the 2014 James Blue Tribute. Notes On James Blue is supported by the James Blue Alliance, a 501 c3 non profit organization dedicated to preserving the legacy of filmmaker and film educator James Blue. All thoughts, opinions, and errors belong to Anne Richardson, and do not necessarily reflect those of the Alliance. Where is life? could be the motto James Blue used to guide his life and career. He was following that compass when he went to Hollywood, and he was following it when he left. What he wanted wasn’t something the studios could help him with. He wanted to explore not just the power of storytelling, but the power of community created by the bond between storyteller and audience. He was interested in the implications of that power, who should wield it, who should be taught how to wield it. He was more interested, in 1979, in passing the talking stick around the circle than with holding his place as head man. 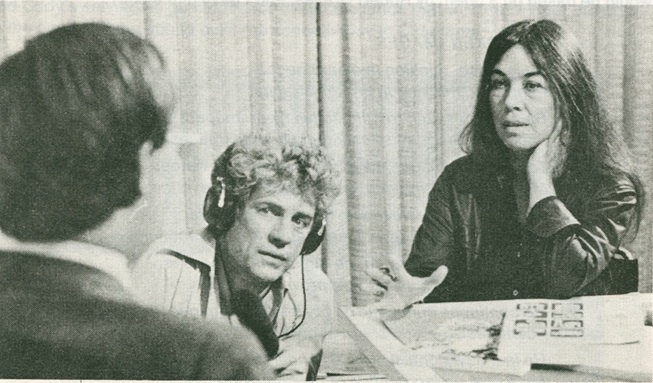 The Invisible City is the most difficult of James Blue’s films to write about. His most ambitious film, it is arguably the one made for the smallest audience. It has no script, or rather, he shares scriptwriting duties with the audience, eliciting feedback from each episode which he then incorporates as he goes along to the next. E pluribus unum. We, the viewers, can make television. We, the citizens, can change our city. James Blue brings everything he has: his skills as an artist, his belief in democracy, his formative brush with want as a child of the Depression, his curiosity about a new medium, video. He does this not as a pitch man or performer, but as a scientist who has set up an experiment, and is intently observing the results. Will this work? In the resulting five hour/five episode interactive public television documentary, James Blue and Adele Santos take us on a tour of a bifurcated city growing like a weed. Petroleum politics had raised oil prices, and Houston was an oil town. Skyscrapers going up, unemployment going down. One thousand new residents were arriving per week. But the filmmakers see two cities. Visible Houston, with no income tax and no state tax, was inhabited by well educated citizens earning high wages. Invisible Houston, for whom the most basic city services did not exist, was inhabited by poorly educated citizens earning low wages. Both categories of citizenry had jobs, thanks to the boom, but a hard working resident of the invisible Houston could be living in a car, or a tin shed, or a house better suited to a wrecking ball. Blue shows us images of deteriorating housing, but, as before, the images which interest him most are the faces of the people. He shows us the bureaucrats behind their desks, the experts with their statistics, and he shows us the people living in sheds or in cars. The mother with four children who was told an apartment flooded with water was the only one within her price range. The social worker, fighting to contain her anger, who was witness to the mother’s distress and helplessness. In Who Killed Fourth Ward?, Blue presented himself as an isolated guerrilla media maker. This time he armors up and presents himself as an academic working with NEH money and in concert with a team of social scientists and grad students. Yes, the poor are always with us, but shouldn’t they have someplace to live? In The Invisible City, James Blue continues to stitch together a vision of television as town hall. Ed Hugetz remembers the first time he heard Blue speak at Rice University. First, we are going to build an audience, he told a handful of students, scattered throughout an otherwise empty auditorium. Then, we are going to become filmmakers. I am struck that James Blue prioritized building an audience so highly. It confirms what we see throughout The Invisible City. He is not trying to make a film. He is trying to make a community. To do this, he reverse engineered the entire filmmaking process. He includes his subjects as collaborators. He includes himself/reveals himself on camera. He chooses public television over theatrical release. He chooses video over film. He tells us what his plan is, and asks the KUHT television audience, after each one hour episode, to contact the station with feedback about where the story should next go. He shares his power as writer-director-producer as elaborately, flamboyantly and comprehensively as possible. James Blue did not know The Invisible City would be his last film. While he was making it, he was recruited by the Center For Media Study at SUNY Buffalo to start a documentary program there. He was planning to make a film about Buffalo using the same approach as The Invisible City when he died of a swiftly moving stomach cancer on June 14, 1980. Adele Santos, the co-creator of The Invisible City, was teaching at Rice University when she approached James Blue with the idea to examine Houston’s housing crisis in a film. Recently retired from her position as dean of the School of Architecture and Planning at MIT, Santos continues to teach. Her firm, Santos Prescott and Associates, is based in San Francisco. I saw the fifth, culminating, episode of The Invisible City on March 13, 2014 in the Schnitzer Museum of Art in Eugene, as part of the James Blue Tribute. Brian Huberman and Ed Hugetz, colleagues of James Blue during his Houston years, opened the evening with an introduction via Skype. 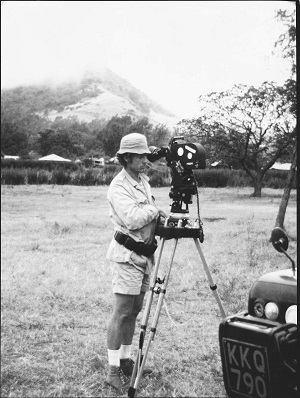 At 7:00 PM on April 23, 2014 in Eugene, at the Schnitzer Museum of Art, reknowned ethnographic filmmaker David MacDougall will introduce Kenya Boran, which he co-directed with James Blue in 1972. The screening is free. More information about other James Blue Tribute events can be found here. Notes On James Blue is a blog kept by Anne Richardson, of Oregon Movies, A to Z, to cover the 2014 James Blue Tribute. The six month long Tribute celebrates the bequest of James Blue’s films to the University of Oregon by the James Blue Alliance, a 501 c3 non profit organization dedicated to preserving the legacy of filmmaker and film educator James Blue. Notes On James Blue is supported by the James Blue Alliance. All thoughts, opinions and errors, however, belong to Anne Richardson, and do not necessarily reflect those of the Alliance.